Ah, half term. A day off with no school run, but two small people to entertain all day. T took control of the tablet this morning and did some major work on his mixel collection, creating some really rather creative Lego bits and pieces. J has discovered scissors, so we spent some time clearing up many scraps of paper from around the living room. I was determined to do a bit of spinning, but the kiddies weren’t really very supportive. We went out for a walk, fully kitted out in waterproofs. J spectacularly face-planted twice, getting covered in mud and scratching her brand new glasses. This evening, after a plateful of courgette fritters, I managed a decent amount of spinning, nearly filling the first bobbin of some Jacob tops. 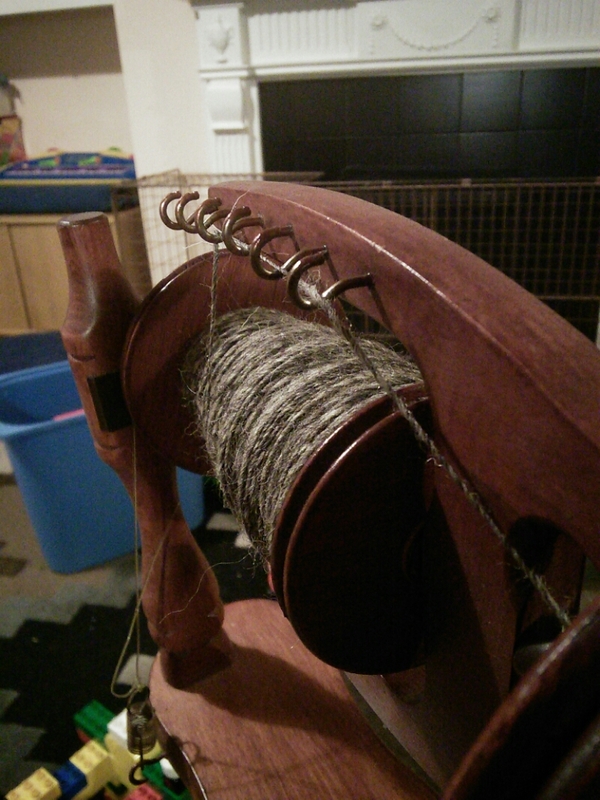 This is the first step in my spinning project: to have two full bobbins to ply, then knit something out of it to see what it is like. In knitting news, I’m nearly at the top of the first Fish Lips Kiss Heel sock. Oh, and a large box of Millamia yarn arrived today, ready for a secret project.